Duplex melting studies demonstrated that the ethynyl side chain has a positive influence on DNA duplex stability when introduced at the 7-position of 7-deazapurines. CBT-P-140 is a verstile compound for DNA functionalization. References P. Ding, D. Wunnicke, H-J. 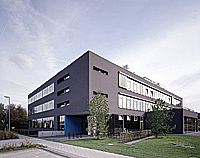 Steinhoff, F. Seela, Chem. Eur. J. 2010, 16, 14385.